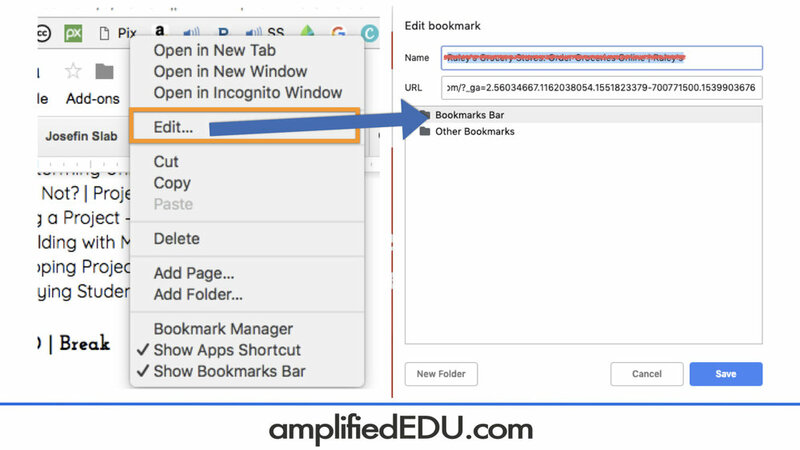 I love how Google Chrome can help teachers and students manage their workflow and focus on the content being studied. Take a look at some of my favorite ways to be more than a browser, and comment on your favorites below! See how many things can fit when I reduce them to only the icons associated with them? These are called favicons, and since we have awesome brand-recognition, we only need these images and maybe a short cue. Use the images to the right to help guide you through the steps below. Make your bookmarks bar appear. Add new bookmarks. Click on the star to the right of the web address (URL). Remove excess words. “Right-click” on any icon and select “Edit.” Delete any text in the “Name” field or edit it to be only what you need. Google Docs Quick Create - Instantly create Google Docs, Spreadsheets, Presentations, Drawings, and Forms. Adblock Plus - Remove ads from your web browsing. Mercury Reader - Simplify your page so you see only the text. Open Dyslexic - Change webpage font to Open Dyslexic. PrintFriendly - Remove extraneous info or change font size to make webpages more printer friendly. EasyBib - Create citations for web sources. Need something even more thorough? Try KnightCite.com. Media Bias Checker - Check where on the political spectrum your source tends to lie. Equatio - Create math equations from text or speech. Share to Classroom - Push resources directly to your students through Google Classroom. Screencastify - Create screencasts: video of what is happening on your computer screen. Grammarly - Check grammar and quickly make corrections. Permanent Clipboard - Hold phrases permanently in a clipboard to paste at any time. CheckMark - Use an abbreviated keyboard in G Suite to leave customized comments. Event Merge - Turn Google Calendar events that appear on multiple calendars into one striped event. Sortd - Change your email inbox into a series of to-do lists. Toby - Organize your tabs into collections to explore later. OneTab - Collapse all open tabs into one tab listing the links; restore at any time. What are your favorite ways to use Google Chrome for teaching and learning? Add them in the comments below! I love Class Dojo. My students love Class Dojo. My students’ parents love Class Dojo. Students love feedback. They love compliments (who doesn’t, right?). They love to know that they have their teacher’s attention. Class Dojo lets them see what I see. They can consult their graphs and hear compliments from me, even if I don’t say them in class. They can track their participation and understand why they get the participation grade they get. They can make their “alien” unique to them by customizing it. (Class Dojo calls them avatars, but I call them aliens because, let’s be honest, middle schoolers are aliens.) They love getting recognized for their positive behaviors. They’re finally hearing positive things from teachers about their students! They receive insight into the classroom about what we did that day and how their student participated in it. Parents recognize that positive feedback is often more powerful in developing a student’s character than negative feedback, and they love that Class Dojo recognizes that. You'll love it too! Sign up here! Ever feel like there's so many things you'd like to learn, but you don't have time? As my eighth graders would start singing, "It's the story of my life." Well, Playdate San Jose is coming up on February 15. It's a good excuse to put your heads together with some other teachers (or teacher-like people) and play to learn. Because a) playing is more fun and b) that's why we do what we do. In Playdate's honor, here are the top three things I'd learn with a few extra hours and a few extra brains. People are doing crazy things with scripts. Like cray-zay. And since I don't have TA's, I need Google to be my TA. I'd learn how to do some crazy things to add the crazy scripts I already know. I think they just might be the way to duplicate my brain. My students are making the coolest things in GarageBand and I constantly think, "That's not fair! I want my voice to sound that cool!" Because somehow, the GarageBand voice sounds so much cooler than the iMovie voice. My students are begging me to let them spend more time writing, directing, filming, and editing videos. We did this on a small scale, but they keep asking for more. I want to know how to manage this and create something on par with the California Student Media Festival (okay, maybe not that intense, but I do want it to be a really big deal). I can't wait for Playdate. And honestly, I don't care if no one else wants to learn what I want to learn. I'll learn it eventually. I just want to hang out with some really smart people and play and learn. Come to Playdate with some ideas. Come to Playdate with some people. Come to Playdate with an open mind. Let's play together.